See the "notes" file for information on the preseason consensus. See the "2012 accuracy" file for a comparison between 2012 preseason predictions and final conference standings. Columns headed with yellow backgrounds are online sites that are not reviewed by me. Clicking on the column heading text of on online site will take you to the actual site instead of a review. Columns headed with light blue backgrounds are smartphone/tablet apps. 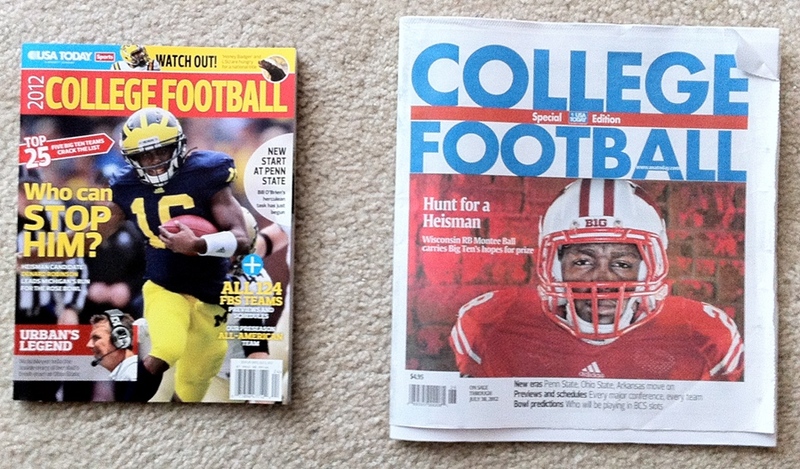 USA Today released two publications this year. One on newsprint, one a glossy magazine. Since the two publications contained different predictions, they're both included in the consensus. Media Polls is a collection of polls by each conference's media members. It's not a single publication, but can be used as a baseline for other predictions. Yahoo / Rivals did not have a national top 25 or predictions for several conferences (that I could find) on their web site. PickSixPreviews.com did not predict the non-AQ conferences. The Sporting News did not predict the non-AQ conferences in their iPad app, but they did have predictions posted on their web site. USA Today (newsprint version) did not list a national top 25. CBS Sports did not list a national top 25. Media (conference) polls did not come with a national ranking. Rivals/Yahoo did not publish a national ranking among their preseason previews. Phil Steele predicted a three-way tie between Duke, Miami-Florida, and Virginia for 4th-6th in the ACC Coastal division. USA Today (newsprint version) predicted a tie between Maryland and Wake Forest for 5th-6th place in the ACC Atlantic division. USA Today (newsprint version) predicted a tie between Georgia Tech and Virginia for 2nd-3rd place in the ACC Coastal division. USA Today (magazine version) predicted a tie between Georgia Tech and North Carolina for 2nd-3rd in the ACC Coastal division. USA Today (magazine version) predicted a tie between Miami-Florida and Virginiafor 4th-5th in the ACC Coastal division. College Football Matrix predicted a tie between North Carolina and Virginia Tech for 1st-2nd in the ACC Coastal division. CNN/SI predicted a tie between Clemson and Florida State for 1st-2nd in the ACC Atlantic division. CNN/SI predicted a tie between Maryland and Wake Forest for 5th-6th in the ACC Atlantic division. CNN/SI predicted a tie between Georgia Tech and Virginia Tech for 1st-2nd in the ACC Coastal division. Phil Steele predicted a tie between Cincinnati and Pittsburgh for 4th-5th in the Big East. USA Today (newsprint version) predicted a tie between Pittsburgh and Rutgers for 3rd-4th place in the Big East. USA Today (newsprint version) predicted a tie between Connecticut and Temple for 6th-7th place in the Big East. USA Today (magazine version) predicted a three-way tie between Louisville, South Florida, and Syracuse, for 1st-3rd in the Big East. USA Today (magazine version) predicted a tie between Cincinnati and Pittsburgh for 4th-5th in the Big East. USA Today (magazine version) predicted a tie between Connecticut and Rutgers for 7th-8th in the Big East. College Football Matrix predicted a three-way tie between Cincinnati, Louisville, and Rutgers, for 1st-3rd in the Big East. College Football Matrix predicted a tie between Connecticut and Syracuse for 6th-7th in the Big East. CNN/SI predicted a tie between Louisville and Rutgers for 1st-2nd in the Big East. Phil Steele predicted a tie between Ohio State and Wisconsin for 1st-2nd in the Big Ten Leaders division. Phil Steele predicted a three-way tie between Michigan, Michigan State, and Nebraska for 1st-3rd in the Big Ten Legends division. USA Today (newsprint version) predicted a tie between Illinois and Purdue for 3rd-4th place in the Big Ten Leaders division. College Football Matrix predicted a tie between Penn State and Purdue for 3rd-4th in the Big Ten Leaders division. CNN/SI predicted a tie between Illinois and Ohio State for 2nd-3rd in the Big Ten Leadersdivision. Phil Steele predicted a tie between Oklahoma State and Texas for 2nd-3rd in the Big XII. USA Today (newsprint version) predicted a tie between Texas and Texas Christian for 3rd-4th place in the Big XII. USA Today (newsprint version) predicted a tie between Kansas State and Oklahoma State for 5th-6th place in the Big XII. USA Today (magazine version) predicted a tie between Texas and West Virginia for 2nd-3rd in the Big XII. USA Today (magazine version) predicted a tie between Kansas State and Texas Tech for 6th-7th in the Big XII. College Football Matrix predicted a tie between Oklahoma State and Texas for 2nd-3rd in the Big XII. College Football Matrix predicted a four-way tie between Baylor, Kansas State, Texas Christian, and West Virginia, for 4th-7th in the Big XII. CNN/SI predicted a tie between Oklahoma and Texas for 1st-2nd in the Big XII. CNN/SI predicted a tie between Kansas State and West Virginia for 3rd-4th in the Big XII. CNN/SI predicted a three-way tie between Baylor, Iowa State, and Texas Tech, for 7th-9th in the Big XII. Phil Steele predicted a three-way tie between Houston, Southern Methodist, and Tulsa for 1st-3rd in CUSA West. USA Today (newsprint version) predicted a tie between East Carolina and Marshall for 3rd-4th place in CUSA East. USA Today (newsprint version) predicted a tie between Texas-El Paso and Tulane for 5th-6th place in CUSA West. USA Today (magazine version) predicted a tie between East Carolina and Southern Miss for 1st-2nd in CUSA East. USA Today (magazine version) predicted a tie between Houston and Tulsa for 2nd-3rd in CUSA West. USA Today (magazine version) predicted a tie between Texas-El Paso and Tulane for 5th-6th in CUSA West. College Football Matrix predicted a tie between East Carolina and Marshall for 3rd-4th in CUSA East. CNN/SI predicted a tie between Alabama-Birmingham and Memphis for 5th-6th in CUSA East. CNN/SI predicted a tie between Rice and Texas-Rl Paso for 4th-5th in CUSA West. Phil Steele predicted a three-way tie between Bowling Green, Miami-Ohio, and Ohio for 1st-3rd in the MAC East. USA Today (newsprint version) predicted a tie between Bowling Green and Kent State for 2nd-3rd place in the MAC East. USA Today (newsprint version) predicted a tie between Buffalo and Miami-Ohio for 4th-5th place in the MAC East. USA Today (newsprint version) predicted a tie between Toledo and Western Michigan for 2nd-3rd place in the MAC West. USA Today (newsprint version) predicted a tie between Central Michigan and Eastern Michigan for 5th-6th place in the MAC West. Blue Ribbon / ESPN omitted Massachusetts from the MAC standings. USA Today (magazine version) predicted a three-way tie between Bowling Green, Kent State, and Miami-Ohio, for 2nd-4th in the MAC East. College Football Matrix predicted a tie between Northern Illinois and Toledo for 2nd-3rd in the MAC West. CNN/SI predicted a tie between Buffalo and Massachusetts for 5th-6th in the MAC East. CNN/SI predicted a tie between Northern Illinois and Toledo for 1st-2nd in the MAC West. Phil Steele predicted a tie between San Diego State and Wyoming for 5th-6th in the Mountain West. USA Today (newsprint version) predicted a three-way tie between Fresno State, Hawaii, and Nevada, for 3rd-5th in the Mountain West. USA Today (newsprint version) predicted a tie between Air Force and San Diego State for 6th-7th place in the Mountain West. USA Today (magazine version) predicted a tie between Fresno State and San Diego State for 2nd-3rdin the Mountain West. USA Today (magazine version) predicted a tie between Air Force and Wyoming for 5th-6th in the Mountain West. USA Today (magazine version) predicted a tie between Nevada-Las Vegas and New Mexico for 9th-10th in the Mountain West. College Football Matrix predicted a tie between Colorado State and Nevada for 5th-6th in the Mountain West. College Football Matrix predicted a tie between Nevada-Las Vegas and Wyoming for 7th-8th in the Mountain West. College Football Matrix predicted a tie between Air Force and New Mexico for 9th-10th in the Mountain West. CNN/SI predicted a three-way tie between Air Force, Fresno State, and Wyoming, for 4th-6th in the Mountain West. CNN/SI predicted a tie between Colorado State and Hawaii for 7th-8th in the Mountain West. USA Today (newsprint version) predicted a tie between Arizona and Arizona State for 4th-5th place in the Pac-12 South. USA Today (magazine version) predicted a tie between Arizona State and UCLA for 3rd-4th in the Pac-12 South. College Football Matrix predicted a tie between UCLA and Utah for 2nd-3rd in the Pac-12 South. CNN/SI predicted a three-way tie between California, Washington, and Washington State, for 3rd-5th in the Pac-12 North. Phil Steele predicted a tie between Florida and Georgia for 1st-2nd in the SEC East. Phil Steele predicted a tie between South Carolina and Tennessee for 3rd-4th in the SEC East. Phil Steele predicted a tie between Missouri and Vanderbilt for 5th-6th in the SEC East. Phil Steele predicted a tie between Alabama and Louisiana State for 1st-2nd in the SEC West. USA Today (newsprint version) predicted a tie between Florida and Missouri for 3rd-4th place in the SEC East. USA Today (newsprint version) predicted a tie between Tennessee and Vanderbilt for 5th-6th place in the SEC East. USA Today (magazine version) predicted a tie between Missouri and Tennessee for 4th-5th in the SEC East. USA Today (magazine version) predicted a tie between Alabama and Arkansas for 2nd-3rd in the SEC West. USA Today (magazine version) predicted a tie between Auburn and Texas A&M for 4th-5th in the SEC West. College Football Matrix predicted a tie between Georgia and South Carolina for 1st-2nd in the SEC East. College Football Matrix predicted a tie between Kentucky and Vanderbilt for 6th-7th in the SEC East. College Football Matrix predicted a tie between Alabama and Louisiana State for 1st-2nd in the SEC West. College Football Matrix predicted a three-way tie between Arkansas, Mississippi State, and Texas A&M for 4th-6th in the SEC West. CNN/SI predicted a tie between Florida and Missouri for 3rd-4th in the SEC East. CNN/SI predicted a tie between Alabama and Louisiana State for 1st-2nd in the SEC West. CNN/SI predicted a tie between Arkansas and Auburn for 3rd-4th in the SEC West. Phil Steele predicted a tie between Arkansas State and Western Kentucky for 4th-5th in the Sun Belt. Phil Steele predicted a tie between Louisiana-Monroe and Middle Tennessee for 6th-7th in the Sun Belt. USA Today (newsprint version) predicted a tie between Louisiana-Monroe and Western Kentucky for 4th-5th place in the Sun Belt. USA Today (newsprint version) predicted a tie between Middle Tennessee and North Texas for 7th-8th place in the Sun Belt. Blue Ribbon / ESPN omitted South Alabama from the Sun Belt standings. USA Today (magazine version) predicted a tie between Middle Tennessee and North Texas for 7th-8th in the Sun Belt. College Football Matrix predicted a tie between Arkansas State and Louisiana-Lafayette for 3rd-4th in the Sun Belt. CNN/SI predicted a tie between North Texas and Troy for 5th-6th in the Sun Belt. Phil Steele predicted a tie between San Jose State and Utah State for 2nd-3rd in the WAC. USA Today (magazine version) predicted a tie between Louisiana Tech and Utah State for 1st-2nd in the WAC. USA Today (magazine version) predicted a tie between New Mexico State and San Jose State for 3rd-4th in the WAC.